An interesting addition to any collection with any imperfections as scanned. The scan/scans shown are of the item for sale unless otherwise stated. This is a single in fine used condition. S Leone QV 1 shilling SG 50 used. Sierra Leone 1897 QV 2½d on 1s dull lilac (SG Type 13 surch) very fine used. Gibbons # 66b. Scott # 59A. Year of issue: 1956. Type: Single. Newly Listed/New Arrivals. Commonwealth & Empire. Collections & Mixtures. Era: Queen Elizabeth II (1952-). Price: £21.00. 1876 1/2d Brown SG16. Year of issue: 1876. Sierra Leone. Grade: Fine. Type: Single. Condition: Used. Newly Listed/New Arrivals. Commonwealth & Empire. Year of issue: 1888. Grade: Fine. Condition: Used. British Honduras/Beli​ze. Newly Listed/New Arrivals. Commonwealth & Empire. Collections & Mixtures. Year of issue: 1885. Grade: Fine. Occasionally we all make mistakes, and if we do we fix it. Condition: Used. Era: Queen Victoria (1837-1901). Type: Single. SIERRA LEONE Queen Victoria 1872 to 1873. SG 11 to SG 14. Add to Favourites. Very Fine Used Catalogue Value £205 . 1874 6d Reddish Lilac SG4. Year of issue: 1874. Sierra Leone. Grade: Fine. Condition: Used. Newly Listed/New Arrivals. Commonwealth & Empire. Collections & Mixtures. Queen Victoria 1883. SIERRA LEONE. made with love by. Catalogue Value £35 . Very Fine Used. Year of issue: 1872. Type: Single. Collections & Mixtures. Price: £20.00. THIS IS A SINGLE IN GOOD FINE USED CONDITION. SIERRA LEONE THE 1903 EVII £1 PURPLE-RED FINE USED ,SEE SCANS. S Leone QV 6d SG 49 used. Year of issue: 1897. Grade: Fine. Occasionally we all make mistakes, and if we do we fix it. Condition: Used. Era: Queen Victoria (1837-1901). Type: Single. Year of issue: 1859. Grade: Fine. Occasionally we all make mistakes, and if we do we fix it. Type: Single. Condition: Used. Era: Queen Victoria (1837-1901). Price: £195.00. Sierra Leone 1911 KEVII £1 purple & black/red very fine used. SG 111. Sc 102. Sierra Leone 1911 KEVII £1 purple & black/red very fine used. Gibbons # 111. Scott # 102. Year of issue: 1938. Grade: Fine. Condition: Used. British Honduras/Beli​ze. Newly Listed/New Arrivals. Commonwealth & Empire. Collections & Mixtures. Sierra Leone 1897 QV 2½d on 1s dull lilac (SG Type 8 surch) VFU. SG 63. Sc 56. Sierra Leone 1897 QV 2½d on 1s dull lilac (SG Type 8 surch) very fine used. Gibbons # 63. Scott # 56. Year of issue: 1903. Grade: Fine. Occasionally we all make mistakes, and if we do we fix it. Condition: Used. Era: King Edward VII (1901-1910. Type: Single. ). SIERRA LEONNE. 1d PURPLE & ROSINE USED. 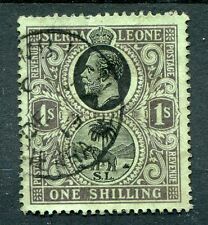 Sierra Leone - 1935 - SG182 - used. 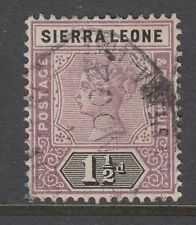 Sierra Leone 1897 QV 2½d on 1s dull lilac (SG Type 9 surch) VFU. SG 64. Sc 59. Sierra Leone 1897 QV 2½d on 1s dull lilac (SG Type 8 surch) very fine used. Gibbons # 64. Scott # 59. Year of issue: 1935. Type: Single. Newly Listed/New Arrivals. Commonwealth & Empire. Collections & Mixtures. Price: £75.00. Year of issue: 1956. Type: Single. Newly Listed/New Arrivals. Commonwealth & Empire. Collections & Mixtures. Era: Queen Elizabeth II (1952-). Price: £6.50. 1938 5s Red-Brown SG198. Sierra Leone. Year of issue: 1938. Type: Single. Newly Listed/New Arrivals. Commonwealth & Empire. Collections & Mixtures. Price: £8.00. The Sierra Leone 1935 Silver JUbilee 1d, a fine used single with the 'extra flagstaff' variety in fine used condition. Stanley Gibbons #181a, catalogued at 120.00. Ref: (2019/01/21#10). SIERRA LEONE Queen Victoria 1872 to 1873. SG 8 to SG 10. Very Fine Used Catalogue Value £142 . Add to Favourites. SIERRA LEONE Queen Victoria 1885. Very Fine Used Catalogue Value £35 . Add to Favourites. Single value - Used with an indistinct single ring cds. Scans show both front and back. Our Ref Code: 1704ss065. A very decent good used 1883 twopenny magenta.